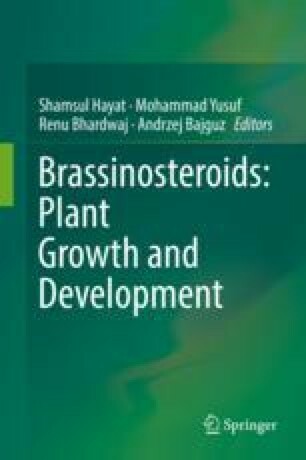 In recent years, it was shown that brassinosteroids (BS) exert their effects not only on plants but also on animals and man. Eventually, some of these effects allowed considering BS as potential anticarcinogenic agents. The background for searching new chemotherapeutic agents among representatives of this group of phytohormones is their antiproliferative activity shown on a number of cancer cell lines, their ability to inhibit angiogenesis, and low cytotoxicity to normal cells. A higher efficiency was found for some synthetic derivatives of BS. It is believed that BS are involved in the regulation of the cell cycle and induce apoptosis through the pathways independent of androgenic and estrogenic receptors. However, in general, the molecular mechanism of action of BS remains largely unclear. Nowadays, BS and their anticarcinogenic properties are actively studied in many laboratories worldwide. The purpose of this review is to analyze and summarize the data obtained on the topic by our research group. Among various aspects of BS anticancer activity, their cytotoxicity in cancer cells, participation of reactive oxygen species in BS-mediated death of tumor cells, and BS inhibition of procarcinogen activation will be discussed in more detail. Czarnocka, W., & Karpinski, S. (2018). Friend or foe? Reactive oxygen species production, scavenging and signaling in plant response to environmental stresses. Free Radical Biology & Medicine. https://doi.org/10.1016/j.freeradbiomed.2018.01.011.